The fourth episode of Adventures in Alpha Land is now available for your listening pleasure. This episode is a continuation of the discussion started in episode 2, in which we planned out a new set of demos for Alpha Anywhere. Dan Bricklin has had a chance to experiment with some of these ideas, and has come to the conclusion that Adam Green's idea of not using a database in the first demo is a mistake. A lively debate follows. Tune in to see who wins. 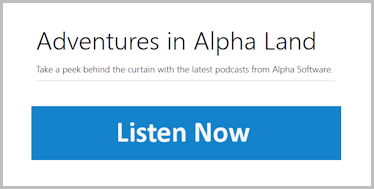 We started this podcast series with the goal of making the development process at Alpha Software more transparent. This episode lives up to that ideal.